Fietstocht! This will be slightly different. Rather than putting the bike on the train, I'm going to get it. It is still parked out in Zandvoort. 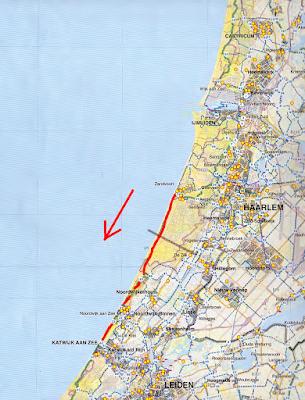 So the idea is to head down the coast, a route I have long contemplated. The weather today, and as forecast for the upcoming week, is not ideal. But it should remain warm, 20°C or above. Today the sky is filled with big cumulus clouds with patches of blue between them. Sun is not out of the question. A bit windy. 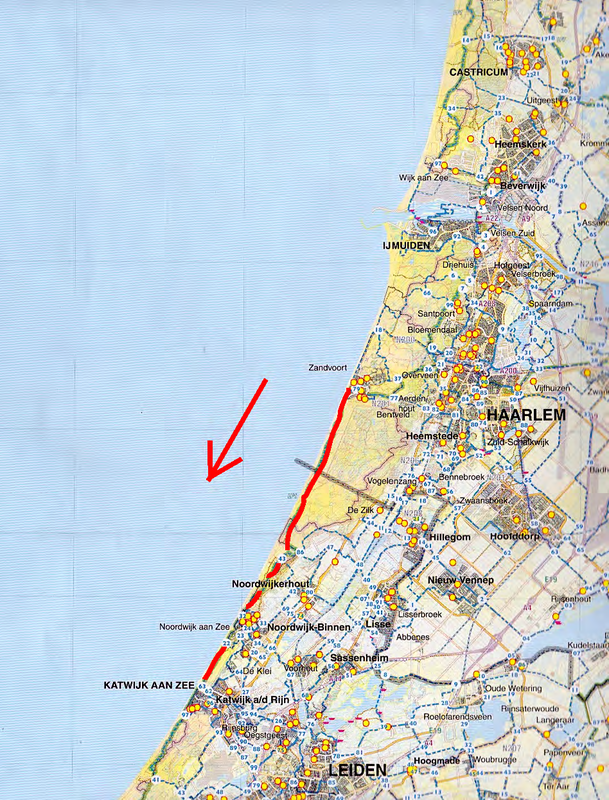 For today I have the modest ambition of getting to Katwijk, around 29km from Zandvoort. 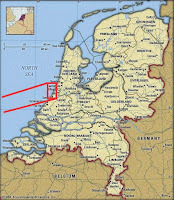 Saturday I'll aim for 's-Gravenzande which is not far from Hoek van Holland. After that the Maasvlakte and Rockanje. Then it will depend on the weather and my mood. 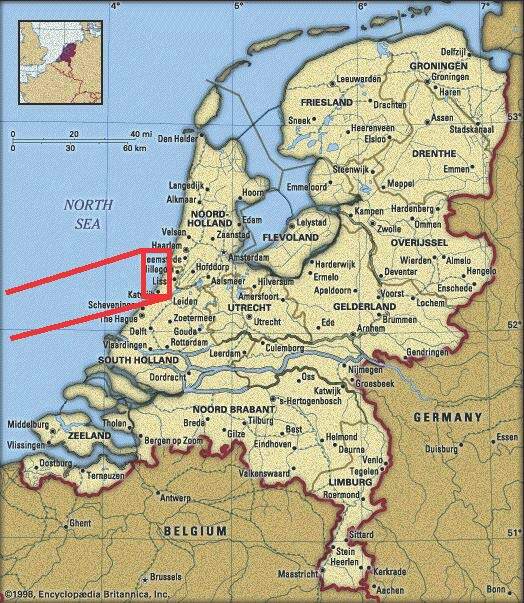 But in theory I could make it down to Vlissingen, then Ghent. Checking my old correspondence, I see that it's been three years since I visited Rockanje. Last year it was Drenthe and Twente, the year before, the guidebook project. A bike tour gives me momentary cause for optimism and the sense that yes, this is where I belong. These notions are tenuous and need to be reinforced. Just crossed into Zuid-Holland: Boswachterij Nordwijk. As predicted it is extremely windy but warm with plenty of sunshine between the low giant clouds. Though the wind is supposed to be blowing west to east, I am riding against it going south. I've found the stone wall of an abandoned structure that I can use as a shield sitting on the north side so I can have my sandwich. The mass of grayish clouds bunched up on the horizon drifts inexorably east over a desert landscape of sandy hills carpeted with grass and shrubs. Nearing kp 31, I reach the turnoff for Noordwijk beach no 28 and hike up the sandy trail to check it out. Over a relatively low rise the choppy sea spreads majestically, endlessly. The beach here is utterly wild, feeling as remote as any Caribbean beach. No one's on it today due to the fierce wind. Not far ahead at kp 31 is the principal beach with cafes where I had an ice cream last time. This time I keep going toward kp 86, and the brick trail turns to packed white sand. Then it turns and climbs inland. The sun is hot, and heading east, momentarily with the wind at my back, I feel elated. At kp 86, I turn right (south), and I am covering new ground. Here the trail enters a forest, the trees rustling, attenuating the breeze, the sun dappling through and ok, I think, this is why I do this. Emerging from this patch of woods, I find the wind is still blasting and sand drifts over parts of the trail, here made of asphalt. I reach another low-key public beach. It is a stunner but the sand is blasting off the dunes, stinging my eyes and lodging on my eyelids. There is just one cafe, the clapboard, utterly gezellig Zeespiegel Duindameslag, with wraparound windows overlooking the choppy sea, just a few kids hopping or surfing in the waves. A terrace of white picnic tables, inside white-painted wood walls and solid oak tables. Germans at next table. A real beauty, this cafe, and a still interlude from the wind. That's it: the dramatic beach and the cozy cafe.